I've always wondered what the strongest beer in the world is and how would taste. Are there reliable historical records of a very strong beer? What would be the highest % alcohol that's Brewable for a beer? And also of course it would be great to know where to get such a beer from. There are strains of Saccharomyces Cerevisiae (brewer's yeast) such as WLP099 - Super High Gravity Ale Yeast that reportedly can tolerate up to 25% alcohol by volume. The world's strongest beer is Snake Venom coming in at a colossal 67.5% abv. Sources cite it as freeze-distilled, where the beer is frozen and the ice (pure water) is drawn off, leaving a more concentrated beer behind. Although, comments in the same link cast doubt upon if the beer is truly the abv claimed. There has been a bit of a battle recently, with Brewdog and Schorschbräu constantly topping each other's efforts: BrewDog Blog. Currently it's a Schorschbräu Schorschbock 57% finis coronat opus, which comes in at 57.7%, beating Brewdog's latest effort: Schorschbräu Schorschbock 57% finis coronat opus. I'd say the strongest commercially viable option (these 50% beers only ever have a few bottles in the batch and cost a silly amount) in the UK anyway, is Watt Dickie, also by Brewdog, which comes in at 35.0%: BrewDog UK. Oops, I didn't know about Snake Venom, 67.5%: Brewmeister Beer. 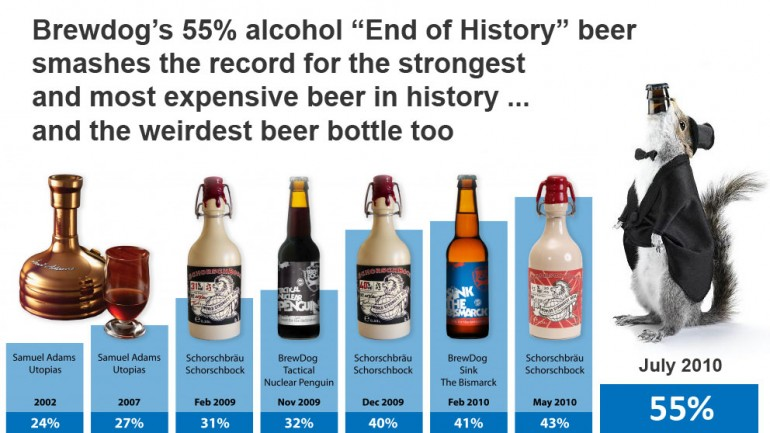 Brewdog's The End of History, at 55% is currently the world's strongest beer. Take a look at the Brewdog Blog. Beverages which do not adhere to these restrictions may not be labeled as beer in Germany, and several other countries. To my knowlege, the strongest beer of kind is Schorschbock 57, an ice-distilled doppelbock with 57,5% alcohol content. This might be a duplicate question, but since as far as I know beer uses fermentation and no distillation, I expect the maximum alcohol level to be around the same maximum as for wine, which I believe is somewhere around the 13% to 15% level (by volume) as this is the level around which micro organisms seem to die. I know some beers in the 10% to 12% range, like the Dutch het Kanon ("the canon") by Grolsch at 11.6% and Grand Prestige by Hertog Jan at 10%, both of which I like. They have a bit of a sweet caramel-like flavour, but I'm not sure if that related to the amount of alcohol in any way. It depends on your definition, commercially available is Kwak, around the same as wine, if you go to the Grand Place it comes in those horse & cart designed bulbous glasses (like a mini yard of ale). Once you go above that the others are all pretty specialist. Not the answer you're looking for? Browse other questions tagged brewing taste history alcohol-level or ask your own question.